For a window exhibition in Art Unit I made a new sculpture; the brown figure with her legs sticking playfully or helplessly in the air. Combined with a classic from 2003, my hanging cathedral, made of hundreds of pieces of lace glued together. 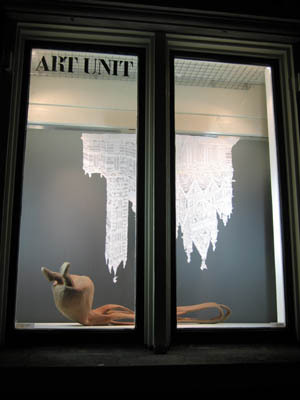 Art Unit is an initiative of Chrystl Rijkeboer, artist (http://www.artunit.org and http://www.rijkeboer.com).